Summer Camp – Troop 195 goes to camp for one week in the summer at Camp Constantin, where scouts focus on earning merit badges. We recommend the First Year Program for new Scouts at Camp Constantin (Buccaneers), which teaches basic camping skills, and helps new Scouts on their way to Tenderfoot, Second Class and First Class ranks. Camping forms are due in March, so be sure to check out the forms section on this website for more information! 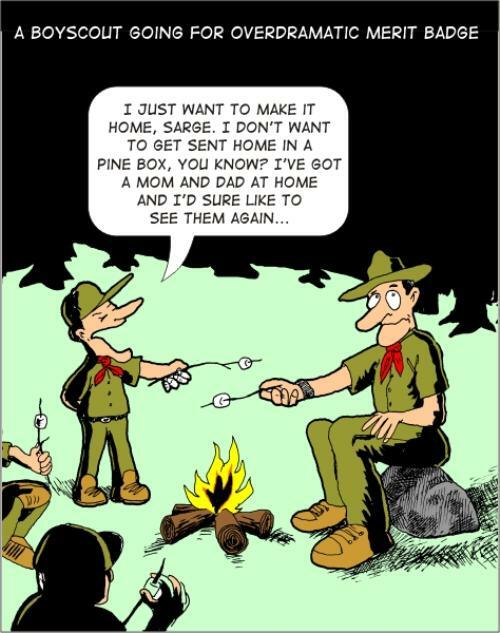 Troop and Patrol Gear – Troop 195 owns tents and cooking gear that are supplied to the patrols. Patrols generally have to supply their own food. The patrol plans meals during regular troop meetings and appoint a Grubmaster to purchase the food and pack it into a cooler. The Troop also issues a lantern to each patrol to use when cooking. Backpacks – DON'T BUY A BACKPACK RIGHT AWAY!!! Since the distance most first year Scouts have to travel is from the back of the car to the tent, a duffle bag or a daypack (like a backpack used for school) is usually sufficient and packs well in car. Sleeping bags – A 25° (F) sleeping bag is more than adequate for most of the trips a new Scout will do in the first year. Even when the temperature goes down to zero the Scouts will be sleeping inside tents with other Scouts, dressed, and with a bag liner or blanket inside the bag. Sleeping bags filled with down are to be avoided. Although they are the “warmest and lightest” they lose almost all of their insulating ability when they get wet (a common occurrence for new Scouts) and cannot be dried out on a camping trip. The new synthetics are almost as good as down, retain most of their insulating capability when wet, and can be dried on a camping trip. Mummy bags are good because they heat up faster, are lighter and easier, and usually come with a hood to keep the head warm. They can sometimes be uncomfortably for new Scouts, however, because they feel constrictive. Boots - Boots are an essential for camping. Sneakers do not provide any ankle support and quickly get wet with a little rain. Boots should go above the ankle and should have a gusseted tongue (the tongue has extra material to the sides that attach to the boot) so that water and dirt are kept out. Look for a minimum number of sewn seams (because they all have to be waterproofed) and a cemented or sewn sole. Get a good foot liner to help wick moisture out of the boot. Socks – Always pack extra socks. Socks should be made of polyester or wool. Once cotton socks become wet (sweating), they stay wet, but polyester and wool socks wick the moisture away from the skin. Even in mild camping weather, feet can become extremely cold with cotton socks! Scouts should have a fresh pair of socks to change into at night, and another pair for the morning. Flashlights – Many scouts use headlamps, which allow you to use the lamp and still have both your hands free. The headlamp is particularly convenient when Scouts are finishing cleaning up after dinner at dusk. Mess kits – Don’t go out and buy those army style mess kits where everything fits inside everything else. They are made of metal which lets the food get cold quickly and easily get bent out of shape. What you want is a good study plastic plate and bowl that will not break when dropped or stuffed into a pack on the way home. Utensils can be any old mismatched set of knife, fork, and spoon that you won’t worry about if it doesn’t come home. For drinks use a good plastic mug. Don’t get a collapsible cup. Many of our Scouts have plates and bowls made of Lexan polycarbonate. Raingear – Almost everyone goes through what we call an “evolution” in raingear. First year Scouts usually wear a poncho. It’s easy to pack, quick to put on, and works for about five minutes in a downpour, unless you’re hiking. By the second year they’ve switched to a plastic or rubber coated rainsuit. While this offers more protection Scouts eventually realize that they are sweating inside as much as its raining outside. Finally they end up in a nylon or Gore-tex rainsuit that lets the body breath and also serves as a jacket when it is cooler. By this time, the Scout has grown significantly, and hopefully will be able to use this rainsuit well into young adulthood. Water Bottle – A water bottle is essential for camping. Most of our scouts carry Nalgene bottles or something similar and clip them to their belt loops with carabiners. Personal First Aid Kit - the Boy Scout motto is Be Prepared - One of the best ways to prepare for an emergency is to pack a personal first aid kit. Who packs?? – Never let someone else pack for you, not even your parents!!! You are the one going camping and in the middle of the night when your flashlight dies and you need your spare batteries, you are the one who needs to know in what pocket of the backpack they are in. Your troop guide or one of the other older scouts should be inspecting your pack for the first campout or two to show you how and to make sure that you haven’t forgotten anything. Also, if it has a battery in it and it is not your flashlight, leave it home. Game boys, i-pods, etc. are not allowed at camp. Never bring anything camping that you’re not afraid of losing or breaking. Extra Clothes - amount depends on length of camp out - BE PREPARED! Pocket Knife (Only if 'Totin Chit' has been earned) - No sheath knives allowed. Toilet Kit to include: toothbrush and toothpaste, soap, comb, shampoo, deodorant, toilet paper in water proof zip-lock bag, wash cloth, bath towel, sun screen, insect repellant, lip balm, glasses/contact care items, etc. NOTE: Troop 195 does not allow any candles, butane lighters, non-folding knives, fireworks, radios/walkmans or computer games on camp outs. If it is not on the list to bring, ask before you bring it. Your Scout Handbook is a good source for additional information on what to pack. Before buying expensive items like sleeping bags, boots and backpacks, we strongly suggest you use suitable family gear or borrow for the first few trips. This lets you see what is needed, what others use, research purchases and take advantage of sales. Troop 195's leaders have camped for years, and can suggest money-saving substitutes, or recommend good quality equipment that will survive the rigors of Scout camping. Scouts also tend to grow quickly and can find that a backpack or boots don't fit after a year. Troop equipment such as tents, tarps, lanterns, stoves, and cooking utensils are furnished by the troop. 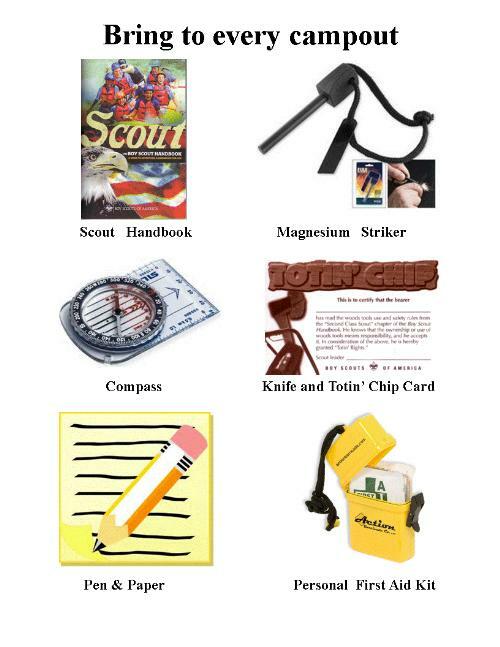 The list below is recommended for those scouts attending Summer Camp. If you have any questions please discuss them with your troop leadership. "Parents visit day is held on Friday afternoon"
____ Scout Uniform - for travel to and from camp, meals, and for ceremonies. Long Uniform pants required, shorts optional. When wearing scout shorts, scout socks are required. Includes: Scout Hat, Scout Belt. ____ Troop T-shirts - 4 Or camp T-shirts if from prior years. ____ Games (NOT electronic) - suggest playing cards, Scrabble, etc. ____ Money - for MB materials, craft supplies, Trading Post goodies, etc. NOTE: Troop 195 does not allow any butane lighters, non-folding knives, fireworks, radios/walkmans or electronic devices/games on camp outs. If it is not on the list of things to bring--ask before you bring it! Prior to coming to camp, scouts are encourage to clearly mark all personal items with their name and troop number. The list below is recommended for those scouts attending Winter Camp. If you have any questions please discuss them with your troop leadership. Toilet Kit to include: toothbrush and toothpaste,shower shoes, towel, soap, comb, shampoo, deodorant, toilet paper in water proof zip-lock bag, wash cloth,rope for clothesline, glasses/contact care items, etc.